"It could be an expressive design that would evoke memories and start a conversation," he said. "It is unique to that person. "If grandad was a long-term Northern Ireland football team supporter, or a fan of a particular GAA (Gaelic Athletic Association) team, we can do it. 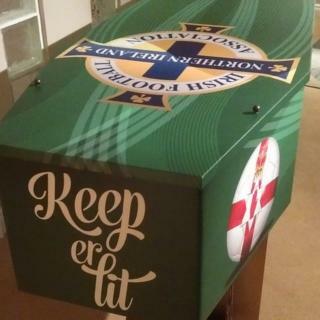 "There is a woman from Lisburn who is a big music fan and she has put in a request to have Elvis Presley on her coffin with the words 'Love Me Tender' on it. "Her husband said he would like a lone piper on his coffin. "Other people might like an image of the Mourne Mountains or the Fermanagh lakes on their coffin - an image that is special to them. We can also put on a photo of the loved one in happier times - the coffin design can have a photograph of the person celebrating a birthday or on holiday. "It is a difficult time for families and these things can help a bit." "I would say that people feel easier about expressing their wishes at the time of death now," he said. "In society now, we have a greater density of faiths and non-faiths. "I have carried out funerals for people who would describe themselves as high priestesses and wizards. "There are a lot more humanist funerals now. The number of cremations has also increased dramatically. There is a lot of change, the number of religious-based funerals seems to be decreasing. "The time that people stay in a funeral home has increased. Some people have booked their holiday and they simply cannot cancel it - the longest we have kept any body here is six weeks." Mr Milne said that population changes in Northern Ireland meant he had become educated in the funeral cultures of various nationalities. "I would do a lot of Eastern European funerals now," he said. "I have also been involved in a number of Vietnamese funerals which are lovely. "They can burn money including (replica) high-value notes, the idea is that the money goes to the higher place where the person who died is supposed to be." Mr Milne also acknowledged that the internet was driving development in the industry and that the "personalisation of the funeral is in full swing". "A lot of people are writing down what they want ahead of their funeral," he added. "I have wishes for people who want to wear ostrich feathers in their coffin. "There are some people who want to be buried with their pets, but because it is consecrated ground that cannot happen. "Some people want to be dressed in their favourite football kit, which would not have happened before." He said he expected imaginative ways of remembering the individual would continue with future generations. "My son Andrew who is 21 works for us and part of his role is to monitor our Facebook page," he said. "The young people are open to change, his generation sees funerals as stuck in the 1950s. "At one of the funerals we did for a young woman recently those in attendance wore pink ties and doves and balloons were released, something that we had not done before. It was a lovely touch. "The people who were friends of the young woman wanted that."